Cloud service roles communicate through internal and external connections. External connections are called input endpoints while internal connections are called internal endpoints. This topic describes how to modify the service definition to create endpoints. The input endpoint is used when you want to expose a port to the outside. You specify the protocol type and the port of the endpoint which then applies for both the external and internal ports for the endpoint. If you want, you can specify a different internal port for the endpoint with the localPort attribute. The input endpoint can use the following protocols: http, https, tcp, udp. To create an input endpoint, add the InputEndpoint child element to the Endpoints element of either a web or worker role. Instance input endpoints are similar to input endpoints but allows you map specific public-facing ports for each individual role instance by using port forwarding on the load balancer. You can specify a single public-facing port, or a range of ports. The instance input endpoint can only use tcp or udp as the protocol. To create an instance input endpoint, add the InstanceInputEndpoint child element to the Endpoints element of either a web or worker role. Internal endpoints are available for instance-to-instance communication. The port is optional and if omitted, a dynamic port is assigned to the endpoint. A port range can be used. There is a limit of five internal endpoints per role. The internal endpoint can use the following protocols: http, tcp, udp, any. To create an internal input endpoint, add the InternalEndpoint child element to the Endpoints element of either a web or worker role. You can also use a port range. There is one minor difference with endpoints when working with both worker and web roles. The web role must have at minimum a single input endpoint using the HTTP protocol. The Azure Managed Library provides methods for role instances to communicate at runtime. From code running within a role instance, you can retrieve information about the existence of other role instances and their endpoints, as well as information about the current role instance. You can only retrieve information about role instances that are running in your cloud service and that define at least one internal endpoint. You cannot obtain data about role instances running in a different service. You can use the Instances property to retrieve instances of a role. First use the CurrentRoleInstance to return a reference to the current role instance, and then use the Role property to return a reference to the role itself. The Instances property returns a collection of RoleInstance objects. This collection always contains the current instance. If the role does not define an internal endpoint, the collection includes the current instance but no other instances. The number of role instances in the collection will always be 1 in the case where no internal endpoint is defined for the role. If the role defines an internal endpoint, its instances are discoverable at runtime, and the number of instances in the collection will correspond to the number of instances specified for the role in the service configuration file. The Azure Managed Library does not provide a means of determining the health of other role instances, but you can implement such health assessments yourself if your service needs this functionality. You can use Azure Diagnostics to obtain information about running role instances. To determine the port number for an internal endpoint on a role instance, you can use the InstanceEndpoints property to return a Dictionary object that contains endpoint names and their corresponding IP addresses and ports. The IPEndpoint property returns the IP address and port for a specified endpoint. The PublicIPEndpoint property returns the port for a load balanced endpoint. The IP address portion of the PublicIPEndpoint property is not used. Here is an example that iterates role instances. Here is an example of a worker role that gets the endpoint exposed through the service definition and starts listening for connections. This code will only work for a deployed service. When running in the Azure Compute Emulator, service configuration elements that create direct port endpoints (InstanceInputEndpoint elements) are ignored. // see the MSDN topic at https://go.microsoft.com/fwlink/?LinkId=166357. Restriction of communication between roles can occur with internal endpoints of both fixed and automatically assigned ports. By default, after an internal endpoint is defined, communication can flow from any role to the internal endpoint of a role without any restrictions. To restrict communication, you must add a NetworkTrafficRules element to the ServiceDefinition element in the service definition file. Only allow network traffic from WebRole1 to WorkerRole1. Only allows network traffic from WebRole1 to WorkerRole1 and WorkerRole2. 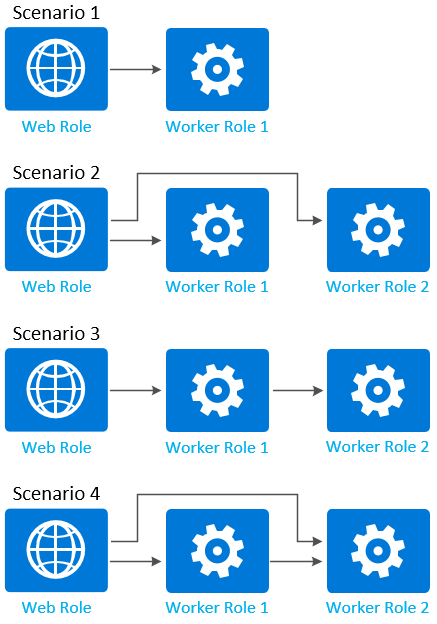 Only allows network traffic from WebRole1 to WorkerRole1, and WorkerRole1 to WorkerRole2. Only allows network traffic from WebRole1 to WorkerRole1, WebRole1 to WorkerRole2, and WorkerRole1 to WorkerRole2. An XML schema reference for the elements used above can be found here. Read more about the Cloud Service model.